You are not alive if a pipe band does not stir your primordial emotions. Who has a dry eye when "Amazing Grace" is played by a hundred pipers? Grade 1 competition will follow the Grade 4 on Saturday and Sunday. 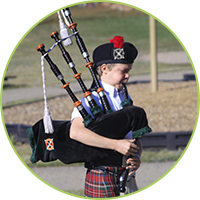 The Longs Peak Scottish Irish Highland Festival has added Grade 5 competition. If competition in Grade 5 please fill out the pipe band entry and denote this is for Grade 5 competition after your band name on the entry.